There was a lot to celebrate when acclaimed author and blogger Leslie Bruce and her family moved into their new home, but the drab master closet left much to be desired. 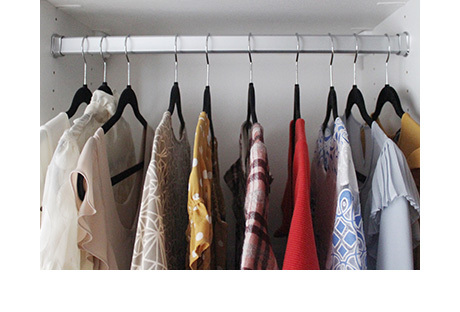 Storing her clothing in multiple closets was not an option for this stylish mom who had accumulated an enviable wardrobe over the years. 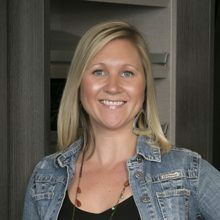 Determined to find a solution, Leslie called in the help of California Closets Orange County, and design consultant Missy Almester was up for the challenge! The strategy? Present a custom plan that would give Leslie the quality and functionality she wanted at a price point she could feel good about. Leslie was so fun, easy to work with, and incredibly smart. From the moment I met with her, I knew we were on the same page. The first step was a clothing purge that helped Leslie focus on clothing and shoes she needed and still wore. For the new closet design, Leslie was drawn to clean lines and simplicity. Understanding smart storage would be key, Missy carefully assessed Leslie’s inventory and came up with a creative custom concept to optimize every inch of the small space. Missy chose a thick material to enhance the design, which included ample room for hanging clothes and slanted shelves to showcase Leslie's enviable shoe collection. To maximize every inch of space and create a continual crisp line throughout the closet, Missy also raised the bottom shelf off the floor. This sounds counterintuitive, but I actually feel like I have more clothes… because I can finally see them! 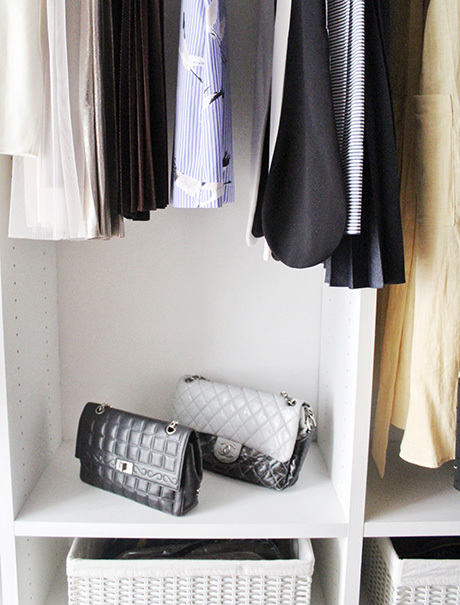 Leslie’s new and improved closet is now well-designed to store and organize her clothes and shoes effectively so that she can find, appreciate, and even add to her wardrobe without worry.